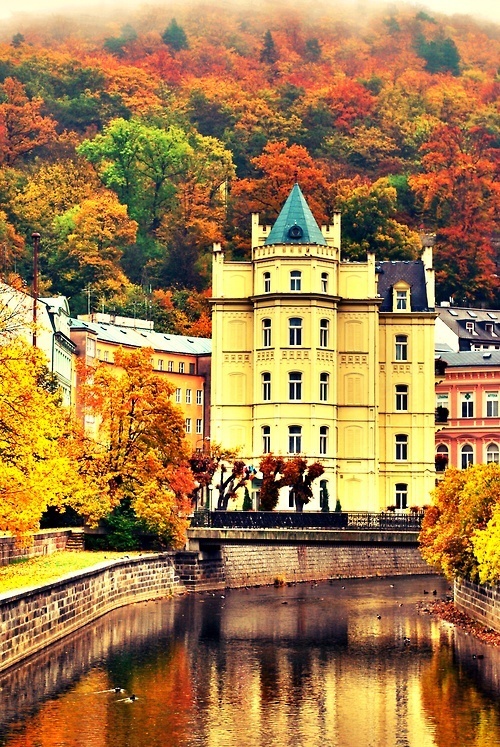 Karlovy Vary is a spa city situated in western Bohemia, Czech Republic, on the confluence of the rivers Ohře and Teplá, approximately 130 km (81 mi) west of Prague (Praha). It is named after King of Bohemia and Holy Roman Emperor Charles IV, who founded the city in 1370. It is historically famous for its hot springs (13 main springs, about 300 smaller springs, and the warm-water Teplá River). In the 19th century, it became a popular tourist destination, especially known for international celebrities visiting for spa treatment. The city is also known for the Karlovy Vary International Film Festival and the popular Czech liqueur Karlovarská Becherovka. The glass manufacturer Moser Glass is located in Karlovy Vary. The city has also given its name to the famous delicacy known as "Carlsbad plums". These plums (usually Quetsch) are candied in hot syrup, then halved and stuffed into dried damsons; this gives them a very intense flavour.